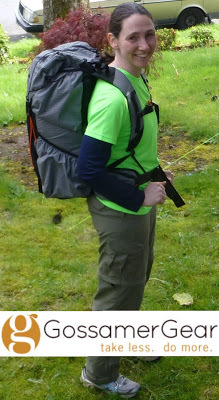 Wired…A Gossamer Gear Trail Ambassador! and backpackers, and adventurers.”…that’s me! Gossamer Gear specializes in lightweight backpacking gear including packs, shelters, trekking poles, sleeping pads, and other accessories. A few weeks ago, I shared with everyone that I was overhauling much of my gear to drastically reduce my pack weight and get my base pack weight under 13lbs. Well, I did it and the item that saved me the most weight was the Gossamer Gear Mariposa Ultralight Backpack. It saved me 13oz from my previous pack without me having to sacrifice the comfort or the volume I’m accustomed to. When I bought the pack, I noticed that Gossamer Gear was looking for new Trail Ambassadors and I applied. My good friend Rockin’ (who will be joining me on the CDT) also applied and was accepted. Yay! There are many benefits that come with being a Trail Ambassador that includes getting a free Gossamer Gear pack and a 25% pro-deal discount.. 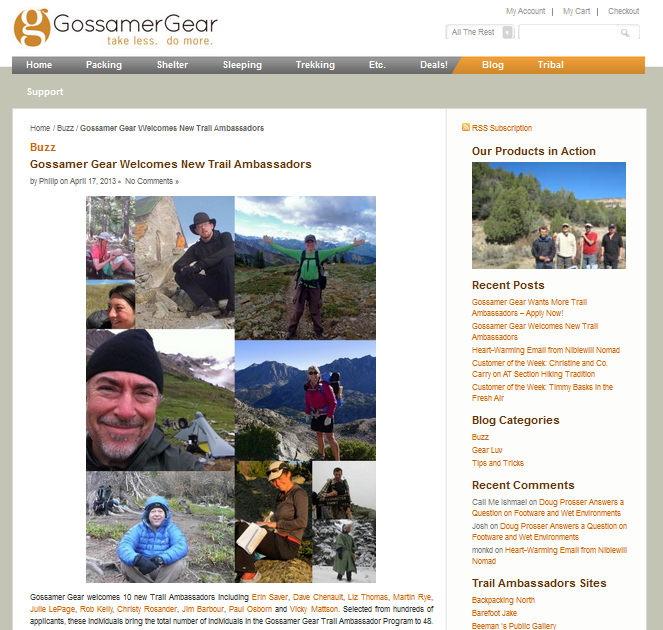 I will also have a personal bio page on the Gossamer Gear website along with all the other Trail Ambassadors. Note that the site is currently in the process of being updated, so the bios of the new Trail Ambassadors aren’t up yet. Here is a screenshot of their blog post announcing this new group of Trail Ambassadors…See me and Rockin’ lookin’ awesome!? So cool! You can read the full article on their blog, which I recommend subscribing to. Gossamer Gear is still looking for plenty more Trail Ambassadors, so if you’re interested, fill out the Trail Ambassador Application Form.